Borrowed from Latin rota (“wheel”). (Britain) A schedule that allocates some task, responsibility or (rarely) privilege between a set of people according to a (possibly periodic) calendar. [The manager] instituted a rota for having the players attend supporters’ club meetings throughout the season, telling them it was part of the job of being a footballer. (music) A kind of zither, played like a guitar, used in the Middle Ages in church music. From Latin rota, from Proto-Indo-European *Hret- (“to roll”). From Proto-Indo-European *Hret- (“to roll”). 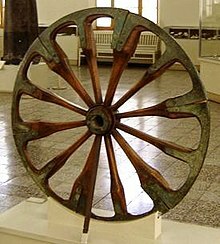 Cognate with Sanskrit रथ (rátha, “chariot”), Lithuanian ratas (“wheel”), Old High German rad (“wheel”) (German Rad (“wheel”)), Albanian rreth. Compare Latin rotundus (“round, circular”). the rim of the wheels, with a set of silver spokes. If you don't have a car, you'd better make your way on foot. Feminine singular of adjective roto. Probably from Romanian roată (“wheel”), ultimately from Latin rota. Feminine singular past participle of romper. Informal second-person singular (tú) affirmative imperative form of rotar. Formal second-person singular (usted) present indicative form of rotar. Third-person singular (él, ella, also used with usted?) present indicative form of rotar. This page was last edited on 7 April 2019, at 05:46.